This 14 Inch pavilion dm4-1165dx from HP is a real best buy device, when you are waiting for a light weighted laptop and amazing screen quality. This gadget can be blindly opted for its outstanding battery life along with great media performance. It costs around $779.99. Aluminum casing has been integrated by HP into this laptop design. This aluminum casing stand unique when compared to other aluminum clad designs in its unparalleled laser-etch design. This type of design can be seen exterior to the device and it handles the remaining laptop, as that of dm4-1173cl which costs about $900 and is 4 starred. Both these devices weigh same i.e. 4.3 pounds, and dm4-1165 weighs slightly lighter than Asus U45Jc-A1, which weighs 4.7 pounds. 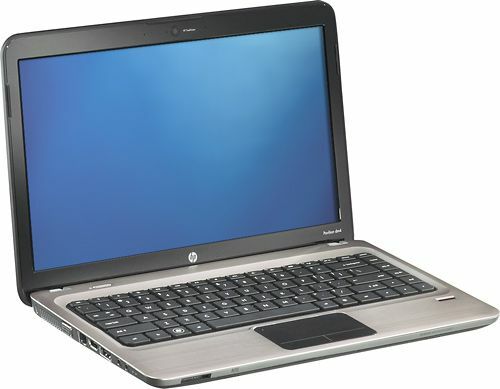 The laptop features a 14 inch screen with a resolution of 1366 x 768, which is standard for its type. If you still want a higher resolution one with 1600 x 900, holding the same 14 inch screen, you can opt for Envy !4 from Hp, but the price will be little higher. This laptop runs Windows7 Home Premium of Microsoft as Operating System. It runs i5-450M of Intel Core processor of 2.4 GHz. It has a Ram of 4GB. Weight of the laptop is around 4.3 lb and size of the screen is 14 inches wide. It features an Intel GMA High Definition Graphics Card and a storage capacity of 500 GB. It has a Dual-layer DVD +/- RW as its optical drive. It has a full size keyboard which is in chiclet design. Each button in the keyboard is a square set apart. It has a touch pad in which the buttons are integrated and this touch pad has a jumpy nature. Hence touch navigation with one click can settle this issue. It has all standard connections such as Dual USB ports, VGA, HDMI, Ethernet, a USB/ eSATA combo port, mic jack and a headphone. It also features finger print reader, which is an added safety feature by HP. This laptop has a clear software package of games etc, and still it is providing a link, which is for a Download Store, where the users can buy whatever software they need. It also features Wi-Fi of 802.11n, with Wireless display and WiMax of Intel. One can have 4G connection with the help of WiMax, in any of the cities that have towers of WiMax. It has a downloading speed ranging from 2 to 5 Mbps and hence one can search web happily, which costs you around $40 monthly. Wireless display allows you to connect the laptop to a HDTV, wirelessly. You may require Netgear Push2TV for this facility and it costs you around $100. The audio of the laptop will be enough for viewing a video on YouTube, but more than this you may require external speakers or use headphones. This laptop couldn’t farewell in the tests of 3D. It has a battery of 55WH which has a batter backup for 6hrs 7mins. Though this batter life was better than dm4-1173cl model of HP, it fell low compared to Asus U45Jc-A1. To conclude, its solid features, great battery life and pretty performance are buying factors for this laptop. This can be a good choice for handling daily tasks on laptop.